Lambayeque is the provincial capital of the same name, located at 06-42-16 L.S. and 79-54-50 L.W. at an elevation of 18 meters. With a population of 51,289 according to the 1995 census, Lambayeque is a charming city of narrow cobbled streets, colonial buildings of beautiful balcony, glorious churches, and shady main plaza. Much of the colonial architectures displays its splendid time in the past, and shows clearly that Lambayeque used to be the main town in this region during the colonial period. Nowadays, Lambayeque is completely overshadowed by Chiclayo, capital of the department of Lambayeque, which has become commercially one of the fastest growing modern cities in Peru. The date of establishment of Lambayeque is not clear in recorded in Peruvian history. However, old documents from the colonial period show that Lambayeque already existed in 1553 being a small settlement of 9,000 inhabitants, and remained two leguas (approximately 1.1 kilometers) from the coast line. It was after 21 years that Francisco Pizarro founded the first Spanish town in Peru, San Miguel de Tangarara in September of 1532. The actual Lambayeque was constructed by Spanish colonists, but it was based upon an indigenous community named Llampallec, a religious center for the Mochica god "Naylamp" (The god name "Naylamp" has been used interchangeably with Naymlap or Naymlap). The word "Llampallec" comes from the Mochica mythology. The most beautiful legend of Lambayeque, with profound historical signification, is handed down from the past. The legend claims that a long time ago a big fleet of totora-reed boats arrived at the seashore of the present inlet of San Jose, located at the mouth of Rio Faquisllanga (the present Rio Lambayeque). The fleet was commanded by a talented chief called Naylamp with a brilliant attendant of foreign warriors. They constructed a sacred temple denominated Chot near the river mouth, and on which Naylamp enshrined an idol representing his proper image, made by a green precious stone like an emerald. It was denominated "Llampallec", which means idol or statue in Mochica language. The temple of Chot actually exists as an archaeological site called Huaca Chotuna and situated at the suburban site known as Lambayeque Viejo. It is located about 6 kilometers southeast of the present Lambayeque. The legend claims that Naylamp was buried at Huaca Chotuna with his representative idol for his existence and his divine power. These days, the indigenous still pay respect to Huaca Chotuna believing that Naylamp was buried with his sacred idol. It is said a green blaze sometime appears on the top of the temple in the night. Lambayeque has begun prospering splendidly since 1720, after the complete destruction of an important colonial settlement in the northern coast, denominated Santiago de Miraflores de Zana (commonly called Zana). Zana was founded in 1563 under the disposition of Virrey Don Diego Lopez de Zuniga, the Count of Nieva, and had been the residential area of the Lambayeque Party's zone leader. Zana was located about 51 kilometers southwest of the present city of Chiclayo, and there are ruins of colonial settlement with strongly-built wall, columns, arches, round roofs, and gallery. On March 15, 1720, Zana was annihilated by deluge of the Zana River. Afterward, people abandoned Zana, and then the residential area of the wealthy family was converted in Lambayeque. On February 12, 1821, the Province of Lambayeque was created as a result of a new political division of the Department of La Libertad. Subsequently, on December 1, 1874, the Department of Lambayeque was founded as a separate entity including two provinces: Chiclayo and Lambayeque. The Province of Lambayeque encompasses 9,346.63 square kilometers, and has 226,218 inhabitants according to the 1995 population census. It has an immense expanse of desert, most of which is flat, but the eastern part of which inclines gradually to the edge of the Cordillera Occidental mountain range. The Province of Lambayeque is divided into 12 districts: Lambayeque, Chochope, Illimo, Jayanca, Mochumi, Morrope, Motupe, Olmos, Pacora, Salas, San Jose, and Tucume. Lambayeque is located 11.4 kilometers north of Chiclayo. Getting from Chiclayo to Lambayeque is totally straightforward. Many urban minibuses (about US$ 0.20) and shared taxis (about US$ 0.30) provide frequent service for the 15 minutes drive between two cities. In September of 1998 during my third visit in Chiclayo, I made a band scan to investigate the existence and nature of any broadcasting activity. Two stations on medium wave transmitting from Lambayeque were easily audible in the daytime: OAX1N Radio Ideal (1409.9 kHz) and OBX1M Radio Naylamp (1580.4 kHz). There was a FM relay station of Radio Hit (104.3 MHz) in Lambayeque, but its signal could not be tuned in Chiclayo. According to the official frequency list of the Ministry of Transports and Communications, issued in September of 1999, the following stations are registered as licensed broadcasters in Lambayeque. 1409.9 - OAX1N - Radio Ideal, Lambayeque; 1 kW SKED: 1000-0500 Transmitter site: Pampa San Martin de Porres, Provincia de Lambayeque, Departamento de Lambayeque. Studio: Jiron San Martin No.440, Lambayeque, Provincia de Lambayeque, Departamento de Lambayeque. 1580.4 - OBX1M - Radio Naylamp, Lambayeque; 1 kW SKED: 1000-0300 Transmitter site: Santa Catalina, Provincia de Lambayeque, Departamento de Lambayeque. Studio: Avenida Andres Avelino Caceres No. 800, Lambayeque, Departamento de Lambayeque. 104.3 - OBW1M	- Radio Hit, Lambayeque; 1 kW SKED: 24 hours (// OCZ5C 90.7 MHz in Ica) Transmitter site: Cerro Pon la Esperanza, Provincia de Lambayeque, Departamento de Lambayeque. Studio:	Conde de Nieva No.125 Urbanizacion Luren, Ica. 560.0 - OBX1H - Radio Mar, Lambayeque ;	1 kW Transmitter site: Lambayeque, Provincia de Lambayeque, Departamento de Lambayeque. 570.0 - OAU1M - Radio Universidad Nacional Pedro Ruiz Gallo, Lambayeque; 1 kW Transmitter site: Prolongacion San Antonio Carretera a San Jose, Lambayeque, Provincia de Lambayeque, Departamento de Lambayeque. Studio:	Ciudad Universitaria, Lambayeque, Provincia de Lambayeque, Departamento de Lambayeque. Radio Naylamp, a shortwave broadcaster named after the Mochica mythology, was first discovered in late of August of 1987, on the variable frequency of 4859.7 kHz in the 60 meter band. The station announced transmitting from Lambayeque on 1580 kHz on medium wave with the following identification: "Transmite desde la ciudad evocadora de Lambayeque para toda la Region Nor Oriental del Maranon, somos Radio Naylamp, frecuencia 1580 amplitud modulada. Nuestros estudios estan ubicados en la Avenida Huamachuco 1080, segundo piso con telefono 3353." Radio Naylamp is undoubtedly known as one of the vagabond stations on shortwave. According to monitoring by Latin American DX enthusiasts, the station is described in the following wandering records: 4859.7V kHz (late August of 1987), 4530 kHz (May of 1991), 5548.5 kHz (March of 1992), 5550.1V kHz (April - May 1992), 4108.5-4108.7 kHz (in the middle of June 1992), 4410.9 kHz (July of 1992), 4299.8 kHz (July of 1992 - November of 1994), 4549.5 kHz (November of 1994 - June of 1995). 4154.7 kHz late (June - September of 1995), 5342.4 kHz (July of 1996 - March of 1997), 5728.5 kHz (in the middle of August of 1997), 4401.4 kHz (early February of 1999), 4402.7 kHz (late February of 1999). It was in late November of 1991 that another station identified itself with the same Mochica's god name was logged on the frequency range between 4300.0kHz and 4299.8kHz. Identifying with a slogan "Radio Naylamp, Estacion Pucara, para toda la Region Nor Oriental del Maranon", the station announced transmitting on 1150 kHz medium wave from the District of Pucara, Province of Jaen, in the Department of Cajamarca. At that same time, Radio Regional, another unlicensed shortwave station transmitting from the Province of San Marcos, in the Department of Cajamarca, had been active on 4299.5 kHz. After two months, apparently to avoid interference from Radio Regional, Radio Naylamp "Estacion Pucara" moved down to unstable frequency range between 4079.42 kHz and 4086.6 kHz, on which it remained from the middle of February of 1992 through early March 1992. The transmission from Pucara was last logged on 4110.3 kHz in July 1992, thereafter it disappeared from the shortwave band. On December 27, 1994, I visited the studio and office of Radio Naylamp, located at Avenida Huamachuco No. 1080 in Lambayeque, near the Bruning Museum where a good collection of archaeological artefacts was exhibited. The station was in a modern two-story building with multicolor illustration of the breve god Naylamp boarding on the traditional totora-reed boat. On the first floor there was a small clinic of Dr. Juan Jose Grandez Vargas. On the second floor, there were a control room (fully equipped with "FRANVEL" brand console mixer, two cassette decks, two turntables, and a microphone), a studio beautifully painted with the god Naylamp on its wall, a record and cassette library, and press room. Dr. Juan Jose Grandez Vargas, the station owner and general manager, remembered having received my reception report for the shortwave outlet, and then sending me a reply with a QSL card and an attractive pennant. Being very surprised for an unexpected visit of a shortwave listener coming from Japan, he gave me a hearty welcome for my visit, and showed around the installation. "Radio Naylamp Empresa Individual de Responsabilidad Limitada" was inaugurated by Dr. Juan Jose Grandez Vargas, on November 7, 1987, for the purpose of providing people with news, information, entertainment and culture. The first experimental broadcast was made in the middle of August 1987, on 1580 kHz medium wave and 4860 kHz in the 60 meter band shortwave respectively. Shortly later on September 7, 1987, the medium wave outlet was authorized to broadcast on 1580 kHz with an output power of 1 kW, with the callsign OBX1M, under Ministerial Resolution No.043-87 TC/TEL for experimental transmission of one year period. Afterwards, on April 20, 1990, the medium wave outlet was definitively licensed under Ministerial Resolution No.0484-90 TCC /15.17. for a ten year period. The station had also applied for the shortwave transmission, but it was rejected due to lack of unoccupied frequencies in the 60 meter band according to the broadcasting system of the Ministry of Transportes and Communications. Therefore, the shortwave transmission was discontinued in a short time under the direction of the inspectors. Studying the official lists of broadcasting stations issued between 1987 and 1998, I noticed that there are not any station assigned on 4860 kHz, however, Radio Naylamp has not been authorized to operate on shortwave until the time of writing. As of December of 1994, Radio Naylamp broadcasts at 0900-0300 daily on the frequency of 1580 kHz, and runs with a staff of seven people. The shortwave outlet operates at two time slots: 0900-1500 and 2300-0300. The station provides news bulletins, music shows, culture, religious, light entertainment, and social service. The newscasts are on the air three times a day from Monday to Saturday: 1200-1400 "Impacto", 1700-1800 "Noticias en el Aire", and 0100-0200 "Hora Veinte". A couple of music programs are hosted by Dr. Juan Jose Grandez Vargas, the station owner and general manager, which includes: 0900-1200 "Despertar Andino" (the early morning folklore program), and 2330- 0030 "Buenas Tardes Ecuador" (the Ecuadorian pasillo show). Dr. Juan Jose Grandez Vargas also owns and runs other broadcasting stations in different regions. The following information was given me when I visited Radio Naylamp in late December of 1994, therefore I consider some of these stations are not on the air on the same condition. Radio Naylamp "Estacion Pucara": was founded on September 8, 1991. The station transmitted on 1150 kHz with a "FRANVEL" brand transmitter of 1 kW, and irregularly operated on the nominal frequency of 4300 kHz with a "FRANVEL" brand transmitter of 0.5 kW. While having being in operation, the medium wave outlet operated at 0900-0100 daily. (When I visited Pucara in late September of 1998, I learned that the station already ceased the transmission few years ago, and the equipment was transferred to Lambayeque. Address: Distrito de Pucara, Provincia de Jaen, Departamento de Cajamarca, Peru. Radio Naylamp "Estacion Fanupe": was founded on August 28, 1993. The station transmits on 1380 kHz with a "FRANVEL" brand transmitter of 0.3 kW, at 0900-0100 daily. It has been in operation without license. Address: Caserio Fanupe, Barrio Nuevo, Distrito Morrope, Provincia de Lambayeque, Departamento de Lambayeque, Peru. Radio Naylamp "Estacion Morrope": was licensed with the callsign OCT2R. The station transmits on 96.1 MHz FM with a "FRANVEL" brand transmitter of 0.1 kW. Address: Calle Real s/n, Morrope, Distrito Morrope, Departamento de Lambayeque, Provincia de Lambayeque, Peru. Radio San Nicolas: was established on April 4, 1986, broadcasting on 1390 kHz medium wave with a "FRANVEL" brand transmitter of 0.5 kW. The station started its shortwave transmission on 3860 kHz in August of 1990, then moved up to 3895 kHz, 3927V kHz, 4002.2 kHz, and then remained on the current frequency range between 5470.6 and 5470.8 kHz since the middle of May of 1992. According to a reply from Violeta H. Grandez Vargas, the station administrator, the station broadcasts simultaneously on 5470 kHz shortwave and 98.5 MHz FM. The both outlets have been in operation without license. Programming is scheduled at 1100-0200 daily. Address: Pasaje Hilario Lopez No.111 entrada del "Hotel Grandez", Rodriguez de Mendoza, Provincia de Rodriguez de Mendoza, Departamento de Amazonas, Peru. Reportedly, Radio Naylamp moved to a new frequency of 4402.7 kHz in late February of 1999. According to the announcement, the station has a new address: Avenida Andres Avelino Caceres No. 800, Lambayeque, Departamento de Lambayeque. So, one should be careful when sending reception reports to the station. Radio Naylamp has been a good verifier since its beginning of shortwave transmission. Certification letter and QSL card are issued for correct reports, and an attractive pennant designed with the god Naylamp is occasionally sent from the station. 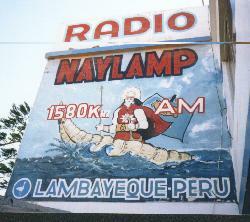 "Desde Lambayeque, transmite Radio Naylamp para todo el Peru. Radio Naylamp llega mas lejos, somos una radio que llega a todos, en Avenida Huamachuco 1080, Lambayeque, Radio Naylamp, AM 1580kHz, Radio Naylamp, la radio de la familia." OBX1M -	1580kHz:	is equipped with a "FRANVEL" brand transmitter, LF-1000 model (1 kW), and a 1/4 wave vertical antenna (48 meters high above the ground). The nominal frequency officially assigned to the medium wave outlet is 1580 kHz, but in fact it was measured on 1580.4 kHz. 4300kHz: was equipped with a "FRANVEL" brand transmitter, LF-500 model (0.5 kW), and a 1/2 wave dipole antenna (15 meters high above the ground). This transmitter was temporally utilized by Radio Naylamp "Estacion Pucara". The nominal frequency was 4300 kHz, but it was actually measured in the frequency range between 4300.0kHz and 4299.8kHz. 4545kHz: was equipped with a "FRANVEL" brand transmitter, LF-1000 model (1 kW), and a 1/2 wave dipole antenna (15 meters high above the ground). The nominal frequency was 4545 kHz, but it was actually measured on 4549.5 kHz. Studio:	Avenida Andres Avelino Caceres No. 800, Lambayeque, Departamento de Lambayeque, Peru.